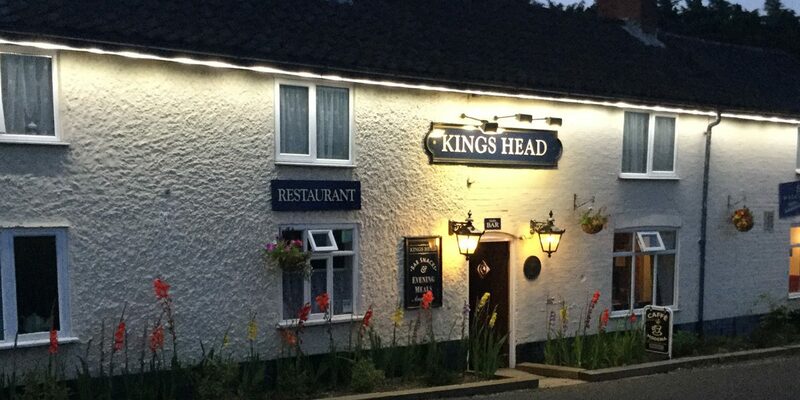 The Kings Head is situated in the idyllic Norfolk countryside and prides itself on its traditional methods of service: everything from the delicious, locally sourced beer and freshly prepared meals it serves to the warm, friendly atmosphere you will notice upon arrival. The Kings Head has everything and more that you would come to expect from a traditional British pub. With a host of events and offers going on throughout the year, including live gigs and entertainment, there’s sure to be something for everyone at this rural country pub. Come in to toast your toes by the open fire or relax in the wonderful pub garden during the warmer months. We look forward to seeing you soon! Tuesday 11:00am until 3:00pm, Wednesday through Thursday 12:00pm until 3:00pm, Friday and Saturday open all day 12:00pm until late, Sunday open all day 12:00pm until 8:00pm, Tuesday through Thursday 5:30pm until late. Closed Mondays. Tuesday through Saturday night 6:00pm until 9:00pm, Tuesday through Saturday lunch 12:00pm until 2:30pm, Sunday 12:30pm until 5:00pm. What’s going on at the Kings Head? Every Tuesday morning is coffee morning from 11:00am. Free biscuits, everyone welcome. Last Tuesday evening of every month is Quiz Night. £1.00 per person. teams no larger than 6. Starting at 7:30pm. Everyone welcome. Free chips at half time. Wednesday nights are Fish & Steak Night. 2 Meals for £20.00. Regular music and Karaoke nights throughout the year.